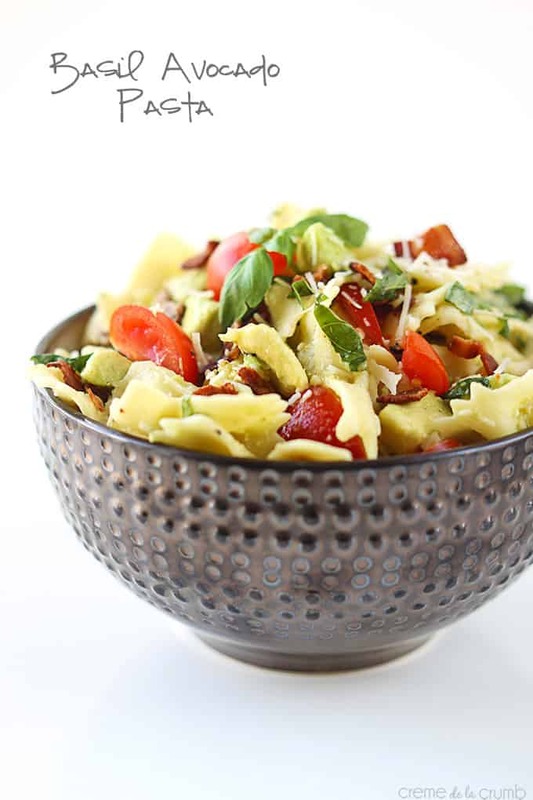 Basil Avocado Pasta – A bright fresh Spring pasta with basil, avocado, bacon, and parmesan cheese! This will be a favorite pasta for the entire family! This pasta? I’m addicted. I ate it all day long yesterday and again for breakfast today. I just, can’t get enough. Even when I think I’ve had my fill and walk away satisfied, ten seconds later it’s calling my name from the fridge. Okay just one more bite. Or ten. We just got back from a two week par-tay on the East coast and it was full of insanely delicious bites like fresh fish tacos, authentic Philly cheesesteaks, and made to order donuts. (Where has that been all my life???) But I have to say, I was dying for some fresh spring time eats. Good homemade stuff with lots of fresh veggies. So when I got home, this pasta was one of the first things to happen. And my gosh it is good. Like, wowzah. And it’s healthy and easy. Winner winner chicken dinner! Actually there is no chicken in this dinner, sorry. But there is a lot of other deliciousness going on. 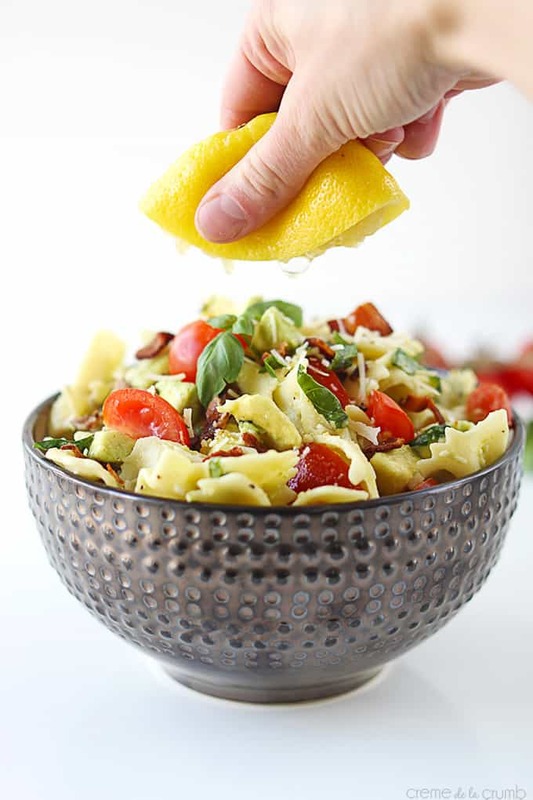 Fresh avocados, basil, shredded parmesan, and bright cherry tomatoes…. and bacon. Oh the bacon. Possibly my favorite part. No the avocado is. No the basil. I don’t know. It’s all good. 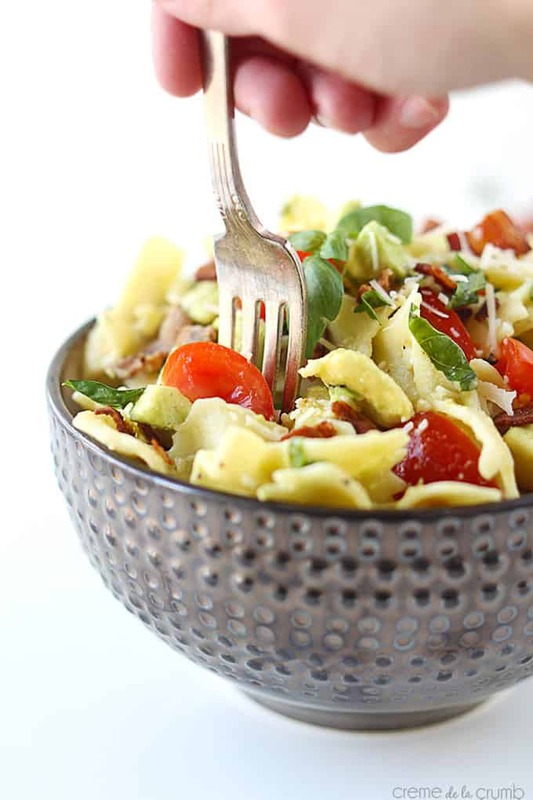 Just throw all of that yum into a bowl, give it a stir, and you’re in for one heck of a tasty Basil Avocado Pasta treat! 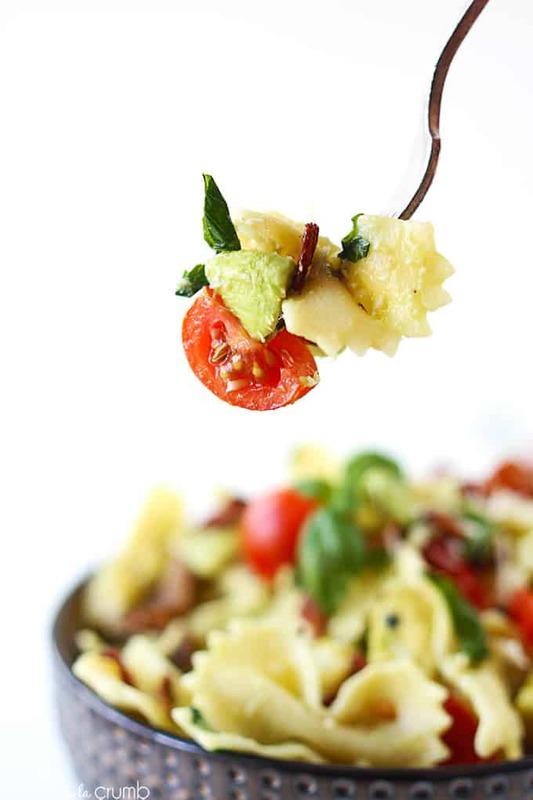 A bright fresh Spring pasta with basil, avocado, bacon, and parmesan cheese! Combine all ingredients in a large bowl. Toss to mix well. Chill until ready to serve, or serve immediately. Enjoy! 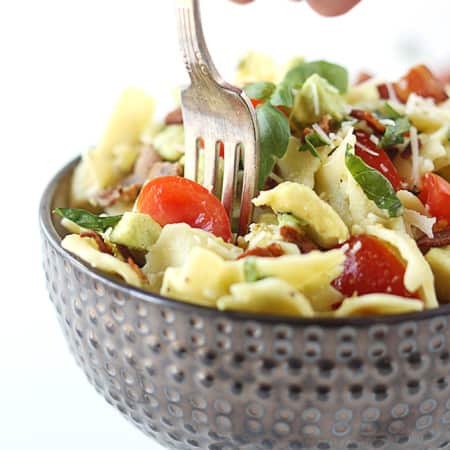 More Pasta Recipes you'll enjoy! That looks amazing! I love avocado in pasta! This pasta looks really yummy. And so healthy with avocado. All of my favorite ingredients combined into one pasta dish! Perfection! I cannot wait to make this.